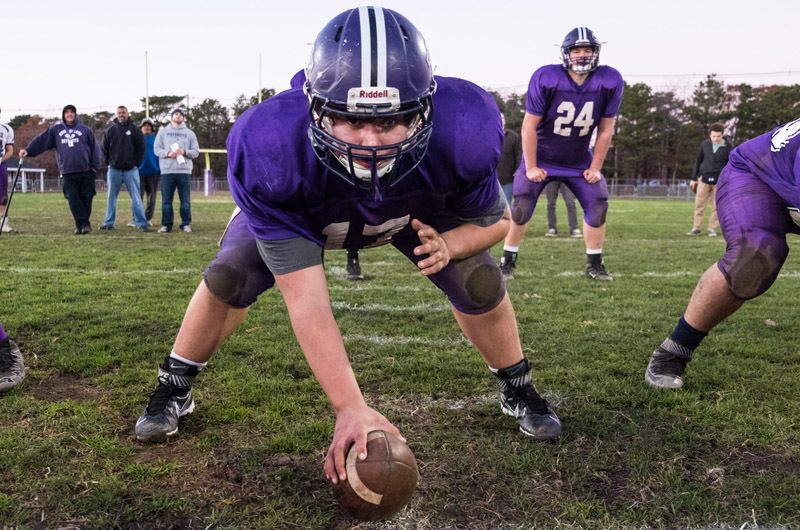 Freshman center Skylar Hall prepares to take on Nantucket in Saturday's big game. Anything can happen at the Island Cup. 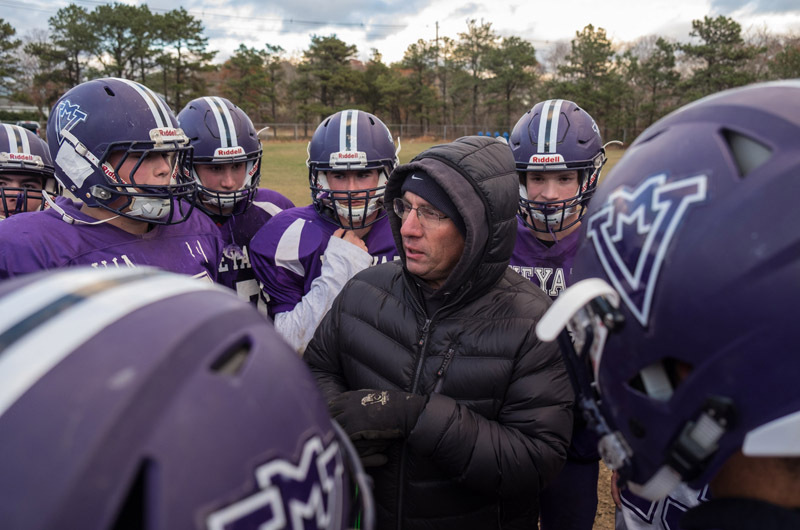 That’s the word from the head coaches on both sides of the longstanding football rivalry between the Vineyard and Nantucket. 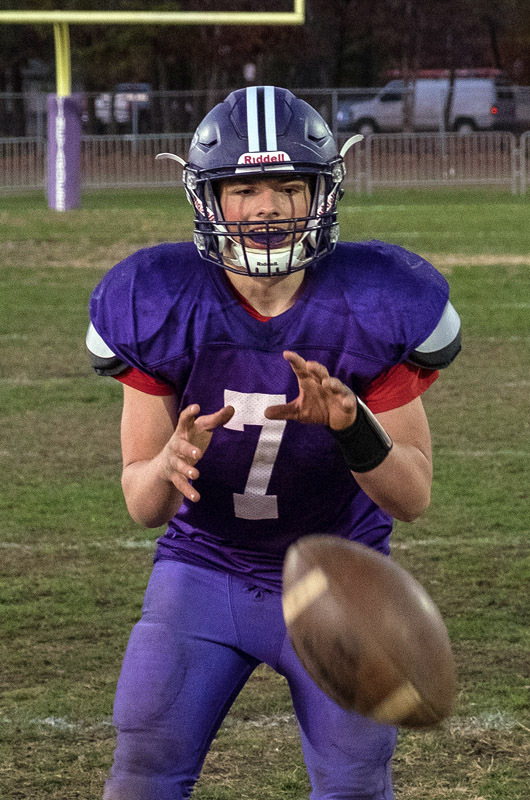 The game takes place on Saturday, Nov. 26, beginning at 1 p.m. at Martha’s Vineyard Regional High School. The Vineyarders have taken the fabled trophy 12 times in a row now. Nobody born in this century can even remember a Nantucket win. But the Cup’s early years were a long run of Whalers victories. From 1978 until 2002, the Vineyard team won just eight of 25 games. This year’s Nantucket team is 8-2 for the 2016 season. The struggling Vineyarders are 1-9. But statistics are meaningless when it comes to the Island Cup, said Whalers head coach Brian Ryder. 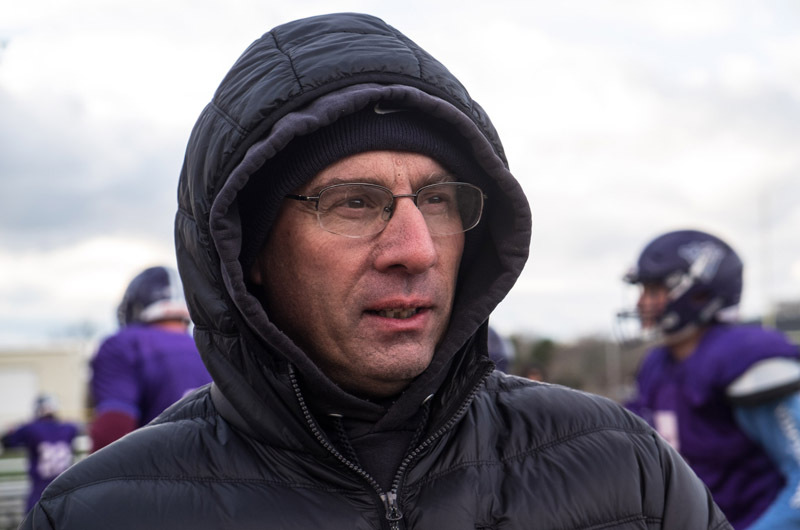 No matter the outcome, the game promises to be fierce, said Vineyarders head coach Stephen McCarthy, who stepped up to the top coaching spot after Don Herman retired at the end of last season. The Vineyarders, meanwhile, have been plagued by injuries this season, with 17 players out of action after getting hurt during games. But like Mr. Ryder, Mr. McCarthy believes that anything is possible in an Island Cup game. “You can throw the records out the window. If you can’t get pumped up for this game, there’s something wrong with you, because this is the biggest game of your career. Especially if you’re a senior and it’s the last one, it means a lot,” Mr. McCarthy said. Mr. McCarthy was speaking from experience. A 1975 MVRHS graduate, he played in the game against Nantucket a few years before the Island Cup was officially established. In addition to the longstanding rivalry on the field, each side also has its own version of the trophy itself. The Vineyarders maintain that in 1978, head coach John Bachellor and assistant coach Bob Tankard piloted a small boat over to Falmouth and purchased the original $127 trophy. Coach Ryder, however, asserts that it was a gift from legendary Whalers coach Vito Capizzo, who retired in 2009 after 45 years and 293 wins. What is not in dispute is that a few years ago the original trophy was retired and new one took its place. Shuttling between the Islands over the decades took its toll on the hardware. But the origin story lingers on for Mr. Ryder and his team’s claim on the trophy. Mr. McCarthy smiled broadly when told of Mr. Capizzo’s claim. “Oh, yeah, sure, that’s what they say. That’s a war, there,” he said. But he refrained from any verbal retaliation, choosing instead to praise the Whalers. Explore the history of the Island Cup. John Bachelller still has the canceled check from when he paid for the original Island Cup. No mystery at all who paid for the Island Cup. We want the cup and will be coming back with it.